Home Meditation Meme How Do You Handle the Turns? How Do You Handle the Turns? As I was driving on the freeway this morning, I noticed a sports car coming up fast in my rear-view mirror. I normally drive in the fast lane and kept watch, figuring I would have to move to the right to get out of his/her way. Then we came up on a big turn in the road, and while I kept my speed up, I noticed the car dropped way back. It sped up again as we hit a straight area, and then, when another big turn came up, the car dropped back significantly. Growing up around race cars and drivers, I learned something early on: the turns are important to winning the race. If you can’t handle the speed in the turns, you won’t come out on top. Being the analogous thinker that I am (“How does this translate to life or spirit?”), I realized that life is also like a race. 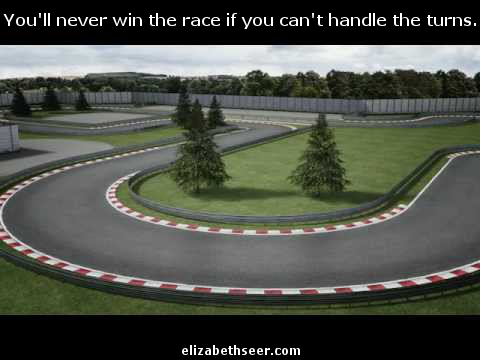 You need to be able to maintain in the curves and turns (of life) if you want to win. Now of course, there are many reasons you wouldn’t be able to maintain speed in a curve, so you might wish to think about getting out of the fast lane. You could be a new driver, lacking the season and wisdom of one more experienced. Maybe you’re new to the track, needing to get a feel for it first, or maybe the weather is a factor. These are all good reasons to slow down for safety’s sake, but if you want to come out on top, you will eventually have to maintain speed through the curves. Whatever you do, don’t slow down so much that you impede other drivers. When your driving has a dangerous, or adverse, effect on others, then you should pull off the road for a while to rethink your strategy. handling life changes, handling turns in life, life is a race, race life, racing for life, racing life, racing spirit, spirituality and racing. Bookmark. Who Should Attend Your Tarot Reading?